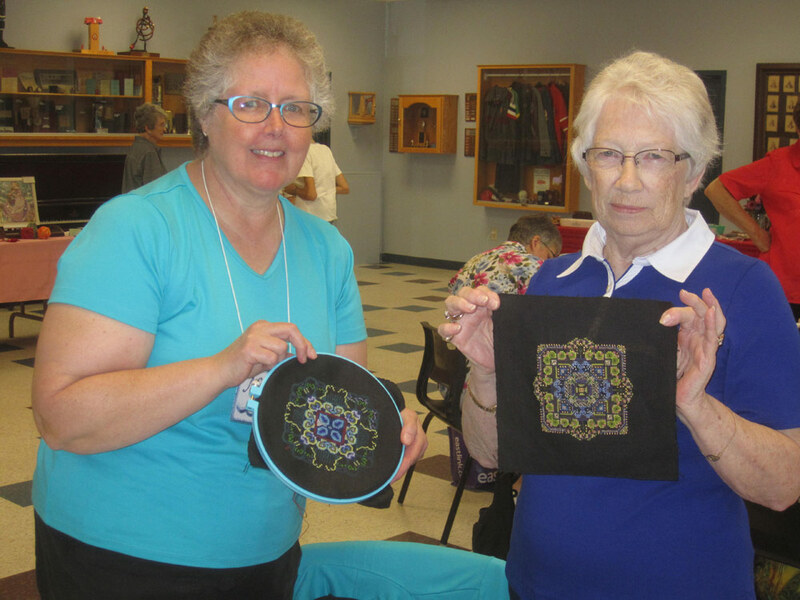 The morning of September 10, 2016 dawned sunny and warm – a super day for leaving our cares behind and travelling to Truro, Nova Scotia for the Third Annual Maritime Stitch-In. Thirty– four EAC members from around the Maritimes gathered at the Fire Hall in Truro, Nova Scotia; it was that kind of day one dreams of but rarely experiences. 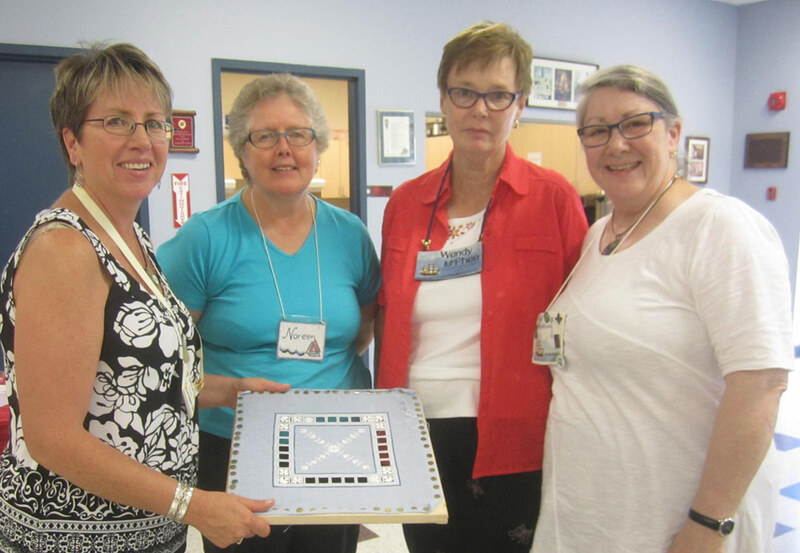 By 10:00 a.m. women from four Nova Scotia Guilds and one New Brunswick Guild were busy storing their brought-from-home lunches, setting up the various treasures they had brought to display, and finding the perfect spot to stitch. The Hall was a-buzz with activity and talk, talk, talk as friendships were renewed, new friendships were forged, and embroidery techniques were explored and discussed. A highlight of the day was the display table. What exquisite stitching! What talented stitchers! A potpourri of colours, threads, and techniques offered a feast for our eyes and temptation to our hands – which had to be held in check as we longed to touch and feel these marvelous offerings. How generous everyone was! 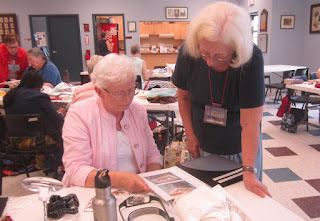 Not only did they share their finished pieces but also related stories of where they found the pattern and how they learned the technique! We were so incredibly lucky to be able to indulge in this feast for the eyes! Works in progress lured many of us. We travelled from table to table, chatting with the stitchers and admiring the work they were painstakingly doing. Some were working on pieces from EAC Seminar 2016. A few Carol Storie’s “Candy Bowls” were on the go. There was cross stitch and canvas work and hardanger and mixed media and... No question was too inane to be answered, no one was too busy to share – everyone was relaxed and willing to share! No day would be complete without the fellowship of a shared meal. 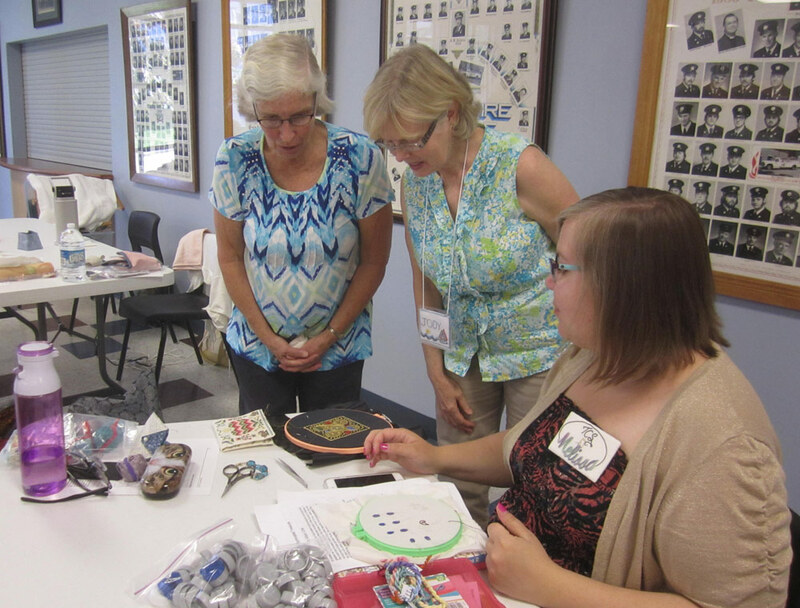 Attendees reluctantly left their stitching when, “Coffee and tea is ready!” rang out. 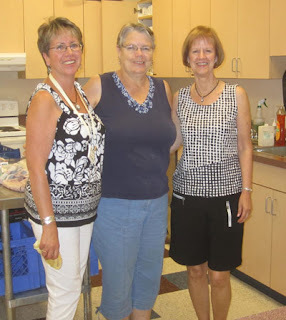 Although each had brought a sandwich or salad for lunch, the dessert repast tempted us to make a meal of dessert! What a feast! From fruit kabobs to pie to cookies and loaf and sweets of all kinds, there was something to tempt everyone’s appetite! Bedford member and Marigold member agree that working on black fabric is a favourite! 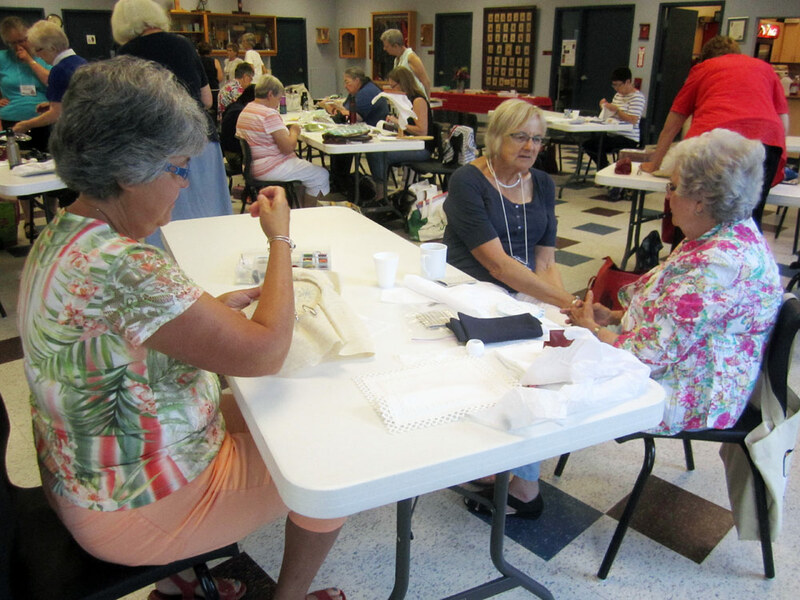 As the day drew to a close, President Leslie circulated among the chattering and busy stitchers to challenge those interested to create a needlebook using the kits of canvas and Appleton wool she distributed. She asked that photos of completed work be sent to her and pledged to circulate the photos in the late Fall. Stitching on the challenge brought back memories of the wonderful day we all had and the finished piece – as well as the photos - will be a lasting reminder of the fun and fellowship we all experienced. And we can dream of coming back next year on September 9th – maybe you will dream too and join us! This was a magical day – a day that proved once again that stitchers are indeed very special, caring, sharing, talented people. How lucky we are to be part of this magical circle!